All relationships are dissatisfying and fake, apart from authenticity. You can’t be authentic if you don’t know who you are. 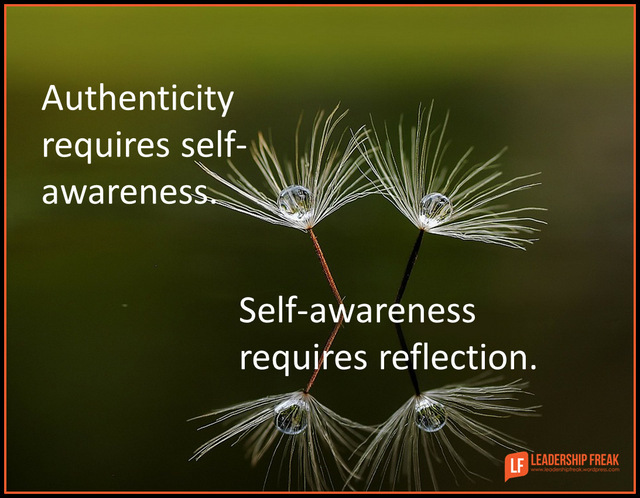 Authenticity requires self-awareness. Self-awareness requires reflection. It’s likely you’re inauthentic if you don’t reflect on your journey. I read a book that elevates my practice of self-reflection, “5 Gears,” by Jeremie Kubicek and Steve Cockram. I’d like to think I’m pretty good at reflection. I spend at least an hour a day reflecting on my leadership, this blog is the result. But, “5 Gears,” gives me language that expands self-reflection. In addition, it helped me turn self-reflection into connection. Do you know what it’s like to be on the other side of you? 1st Gear: Recharge Mode – Personal recharge, completely unplugged. 2nd Gear: Connect Mode – Present with family or friends without work. 3rd Gear: Social Mode – Present with people and can shift up or down easily. 4th Gear: Task Mode – Multitasking; working hard in various ways. 5th Gear: Focus Mode – Task-Centered, fully focused and moving quickly. “5 Gears” provides language to reflect on your mode of being. Perhaps you’re like me, stuck in task mode, when you should be in social or connect mode. Conflict happens when your spouse is in connect mode and you’re in task mode, for example. I use “5 Gears” to name my mode of being. This helps me see myself through the eyes of others. The second benefit is it helps me shift into a gear that facilitates connection. What tools or strategies enable leaders to reflect on their journey? Wow. This is actually pretty deep and I will want to read the book for sure. For me, authenticity is caring sincerely how I affect others both around me and in the larger world. Self-reflection (well, a big part of it anyway) involves looking into another person’s eyes and using that mirror to ask myself questions. Interesting about the 5 gears in relationship to authenticity and self-reflection. Authenticity appears to be a constant in all 5, while self-reflection is broadest and deepest in gear 1 and shallowest in gear five. My initial random reflections. Great post, Dan. 5 gears is unique and impressive theory. Will put it into practice immediately. Cannot Se a reason why it cannot benefit me…. It is great classification (5 gears) our daily activity. I think most of the conflict or interpersonal can avoided using this theory. Eager to read the 5 gear book. Authenticity is an awesome topic. I would suggest that the level of authenticity is contingent on the level allowed. One must consider the organizational culture and climate in which they exist to determine the amount of authenticity “allowed”. Organizational conformity sometimes dictates the level of authenticity permissible based on the type of climate desired. In other words, if the organization mantra is one of conformity, then authenticity is not requested or desired, “just fall in line and go with the flow”. However, if the culture is one that invites creativeness & vision, then authenticity is welcome and encouraged. This is not to say that people should be something they are not but rather that the extent of your authenticity and it’s acceptance will be corralled and subdued based on the climate. We should however strive to foster authenticity and grow it in an effort to create an environment that is conducive to growth and success. Crucial elements in that effort include authenticity. Dammit, Dan. This is consistently my favorite blog. Keep holding up the mirror.